Diapers need to be taken care of properly and if you're not willing to go out and throw a dirty diaper every after a diaper change, then it's definitely a more convenient option to get yourself a diaper pail. How Is A Diaper Pail Different From An Ordinary Trash Can? What Benefits Can You Get From a Diaper Pail? What To Look For In Choosing A Diaper Pail? How To Use A Diaper Pail Properly? A diaper pail is basically a trashcan that’s meant only for diapers. It has special features that are meant to contain a certain amount of diapers at a time. Diaper pails are meant to be emptied on a daily basis and are hence smaller in size. It is also meant to be kept out of the way for the purpose of it not being an eyesore either. An ordinary trashcan is just a container where you put rubbish in. It can be an open container or a container with a lid. A diaper pail, on the other hand, is different. It is a specialized trash can that is created for the sole purpose of containing dirty diapers. Diaper pails are also made not just to store dirty diapers but to also reduce the steamy smell of nasty diapers and are also treated to be antimicrobial. Diaper pails aren't just meant to contain baby diapers but are also meant to temporarily store dirty adult diapers as well. As opposed to an ordinary trashcan with a lid, a diaper pail offers more benefits than cons. You see, we think that a diaper pail is a much better option because it has a sealed lid. Trashcans with lids cannot stand against a curious dog. Dogs can go anywhere and no matter how we train then, they still end up doing something 'bad' like dig through the trash and you wouldn't want your dog digging through the trash with your little one's dirty diapers in there, would you? Anyway, owning a diaper pail means that your pet won't be able to have access to it. If your pet can't dig through it then your baby won't be able to either. Diaper pails don't just store nasty diapers, it also protects the rest of the world - referring to your curious baby and your naughty pet - from getting to it. ​Diaper pails have specialized diaper bags that are antimicrobial. So, at least you won't worry about those crappy nappies from breeding other nasty stuff out there. Diaper pails also come with fresheners. Diaper pails are sealed tight so the smell is more contained as opposed to a typical trash can. Anyway, the smell in a nasty diaper will still eventually leak since anything you put a dirty diaper in will still smell like... a dirty diaper. Let's face it, diaper pails are definitely much more expensive than typical trash bins but it still doesn't mean that the most expensive diaper pail will be the best one. We also consider here the total cost of ownership and not just the initial price. We should always consider just how many diapers it can hold. You'll have to choose a pail that can hold a huge number of diapers at a time while also keeping the smell down to a minimum if not at all. Some diaper pails are bag specific - this means that you need to buy a diaper bag from the same manufacturer. We prefer pails which can also use typical trashbags - besides, you can buy antimicrobial trash bags nowadays - for a much cheaper alternative. Diaper bag replacement. The diaper bag must be easily emptied and replaced and not give you an extremely hard time tugging and pulling and end up ripping the bag apart. Diaper pails are pretty much sealed in and don't require much for you to use it. However, there are some proper diaper disposal tips that will make our house smell less funky overall. In disposing of diapers, folding it properly allows for a better space inside the diaper pail. This is also a way to prevent unwanted nasties from touching the sides and the opening of the diaper pail, you'd really hate it when some of your baby's doodoo got into the opening. Now, that's another mess to clean up. When dealing with a poopy diaper, drop the crap into the toilet and flush. Then dispose of the diaper in the pail. This prevents most of the smell actually. Some households still maintain a stink-free household simply by doing this trick. Putting a poopy diaper in a moist and smell environment is like putting a lit candle beside TNT - it's explosive! Made with powder steel, the Ubbi Steel Diaper Pail is definitely sturdy allowing it to be portable even on bumpy rides. The steel frame offers better containment for the smell. The smooth powder steel is also easy to clean just wipe it off with a dry cloth and not with soapy water or detergent. Although it falls on the more expensive side of diaper pails, we love that it doesn't require a special disposal bag. You can use any trash bag or any other scented antimicrobial diaper bags. It can accommodate any diaper bag of your choice saving money in the long run. The design is definitely a plus factor. It comes in 16 different colors and patterns that work so well in the nursery. You will also love that it is a slim and average sized diaper pail - it can be put in between furniture or even kept under a desk, inside a cabinet, or into tight spaces. Even though it is slim it can still hold about 50 newborn diapers or about 20 extra large diapers in the pail. It has a great sealing feature as well. So far we think that out of the five diaper pails in our list this contains the smell the best because of the steel casing and the rubber seals around the lid and the diaper hole. The lid slides open and has a child lock that prevents your little one from opening it. The Ubbi Steel Diaper Pail is extremely sturdy. It is practically zero maintenance because it doesn't require being washed with soap or detergent. The double rubber seal and non-porous metal casing makes great smell containment. It has great aesthetic value because it comes in 16 different colors and patterns. The child lock is extremely strong. No matter how you shake it, the pail won't budge open. It only requires a one-handed operation in sliding the lid and dropping the diaper in. It is very expensive for a trashcan meant only for diapers. The tiny diaper hole makes it prone to poop smears. It is not a hands-free operation. The Diaper Genie is known for its great odor control. It has great odor sealing capability because the lid contains a deodorizer that absorbs 90% of the stinking steamy poopy diapers. The carbon filter prevents any smell from leaking out. The smell is sealed within the pail as much as possible. The smell is also contained by the odor-cancelling disposable bag. This is a hands-free diaper pail. If your hands are full with you baby in one hand and a nasty diaper in the other, there's nothing to worry about, just step on the foot pedal and you can easily dispose of the diaper without a sweat. Removing and replacing the full diaper disposal bag is made simple. You only need to pull back the front lid. The front pulls back cover is much more efficient than its predecessor here you need to lift the entire diaper bag out. The built-in cutter will easily snip off the disposable bag ready for you to tie and dispose of. The Diaper Genie only uses its own antimicrobial scented disposable bags and they're a bit expensive. With a more compact design, the Diaper Genie can hold about 20-25 small sized diapers. That's considerably a good number of diapers but not as much as other Diaper Genie's can. Still, it is more sanitary to empty out the diaper pail as often as we could - although we kind of find it a bit of a hassle to empty it out every other day. It has a built-in cutter to easily cut the continuous diaper refill for good and easy replacement. It is a hands-free diaper pail with an easy open pedal for your convenience. You can readily purchase an antimicrobial disposable diaper bags online. The slim design allows it to fit in tighter spaces. You need to put your hand inside the opening to fit larger sized diapers. It only uses its own diaper bag refills, no other refills can fit. 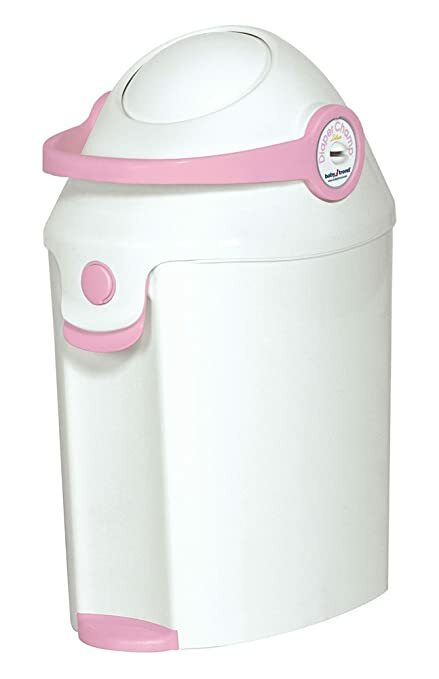 It is more expensive to own this diaper pail as compared to buying it for a much cheaper price. When you had your first baby, you realized just how costly it is to continuously buy disposal diaper and decided to go for cloth diapers. Cloth diapers need its own diaper pail or diaper liner to contain the smell and we like that Dekor Plus can both be a diaper pail for cloth and disposable diapers. The Dekor Plus diaper pail is also hands-free. In fact, they pride themselves for their Step-Drop-Done scheme. True enough, it's that easy. Just step on the pedal, drop the diaper in and you're done. The disposable diaper bags exclusive for Dekor Plus is great since it is odor-cancelling. It already reduces the smell of the poopy diapers. The top lids and the bag door are all sealed in to retain the smell. The entire pail is made of ABS plastic which is great in containing horrid smells. It also comes with a spring loaded trap door that also seals the smell inside. And to top it off, it comes with a rubber sealed lid. It is very spacious containing about 60 newborn diapers or about 30 large diapers. It can hold just as much cloth diapers as well. It is also good that all the doors and lids have childproof locks. It also uses a childproof built-in cutter for your disposable bags making it very safe for you and your child. It's also an added lovable feature that it comes in 6 different colors to choose from. It is made of ABS odor-cancelling plastic bin. It can hold 60 newborn diapers or about 30 large diapers - cloth or disposable. The Dekor diaper pail is totally childproof with a childproof lid, child locked bag door, and a childproof built-in cutter. It comes with a trapdoor that prevents any diaper from backing up and also serves as an odor trap door. The diaper pail is wide enough to be converted into an actual trash bin after using it as a diaper pail. It is short but wide and can be kept inside a cabinet or stored neatly in a corner. It prefers the use Dekor Plus disposable bags even if it can also use a 13-gallon trashbag. It is not totally odor-proof, after a few months, once our open the bag door, the smell is overpowering. The double diaper bag seal needs to be fixed properly all the time to assure the odorless feature of the pail. The Munchkin Diaper Pail boasts the fact that it is the only diaper pail that uses rings and seal, seal and tosses bags. We did confirm that because we tried different diaper disposal bag brands and they all worked like a charm but it is a bit tricky to use an ordinary trash bag because it falls inside the pail if not mounted properly. Powered by Arm and Hammer Lavender Scented baking soda mounted on the lid is one reason why it is great in controlling the odor. If you also use the lavender scented munchkin diaper disposable bags, the smell is literally drowned by the scent. The diaper pail also has a wide door that gives you full access to the diaper bag for easy replacement. The lid has a rubber seal the literally rubber seals the scent inside, so the steaming smell of crappy diapers are locked inside. The seal creates an air-tight locking system. This is made of plastic though, so in time the smell inside starts to get funky plus the added smell of the lavender, it does not create a good mix though. It may be a tall and seemingly big but it cannot hold a lot of diapers. It maxes out at 20 large diapers - that is if you have to stuff them inside. Although it is great in odor control it has a poor diaper capacity. You may also have to stuff and squish the diaper to fit it inside because the opening it pretty tight. It really does a great job in locking in the smell, hands down! It is very sturdy despite it being made of pure plastic. It is very easy to clean, you can just spritz it with vinegar and water or diluted bleach and air dry. It doesn't easily topple. It may be tall but it has a good and stable stand. It is very safe and very easy to use. It cannot hold a lot of diapers making you change the bag every other day. You need to squish the diaper inside but if it is a bigger diaper, you may actually have to stuff it inside the pail with your hand. It is a waste of bag since you need to replace the bag often. The bag is much bigger than the pail itself. It is not childproof at all, you may need to store it somewhere you child cannot reach. Remember the time where you once relied on an ordinary trash bag and you needed to change empty it out every evening just to keep the smell away only because we think it's way cheaper? Well, we can absolutely change the way we think about diaper pails with a more cost-effective Diaper Pail. Overall, in our opinion, we really think that out of the list of diaper pails we have the Baby Trend Diaper Pail has the cheapest cost of ownership. You can use any 13-gallon trash bag with this diaper pail and it is the cheapest in our entire list. It looks great by the way. It's cute and it looks like a home robot of some sorts. What's also good about it is that it comes with a handle - a feature that apparently Baby Trend only thought about - but if your lift the handle, the lid also opens. This is pretty light as well so you can move it around the house without hugging the entire diaper pail. It does have an average diaper smell control. You can still smell the poopy diapers but once you open the lid to drop a dirty diaper, you are hit with an overpowering smell of 'Eau de BabyAss'. With a constantly closed lid, you're good to go. The lid is rubber sealed making it the only and primary odor blocking mechanism. It is also very spacious providing awesome space for more diapers. It can hold about 35 medium sized diapers at a time. It is very cute and stylish, fitting perfectly in the nursery. It is very spacious and has a huge diaper capacity. It is extremely cheap on purchase and also a very cheap cost of ownership. The Baby Trend requires very low maintenance, it is easy to clean and easy wipe. It uses a one-handed operation, just pull the handle up and the lid opens. It has above average odor control. Stinky diaper smell seeps but stays at a minimum. The lid is pretty small so you need to shove it down the hole to fit the dirty diaper in. Replacing the diaper bag means lifting the entire bag out, it can be a problem if the diaper pail is full and it gets stuck. ​Choosing the best diaper pail is definitely difficult but we did find a clear winner. In our opinion, out of a meticulous scrutiny and experience with these diaper pails, we found that the Dekor Plus Diaper Pail is the best. It has superior odor control and it is relatively cheap in the cost of ownership as compared to other pails. The initial cost of purchase is average but the fact that it can use any ordinary 13-gallon trashbag puts the cost of ownership at a minimum. It - along with Munchkin and Diaper Genie - are very easy to empty out and replace the bags with. It has massive diaper capacity. Actually, in our list, it is the one that holds the most diapers, it does come in smaller sizes but capacity is still great. 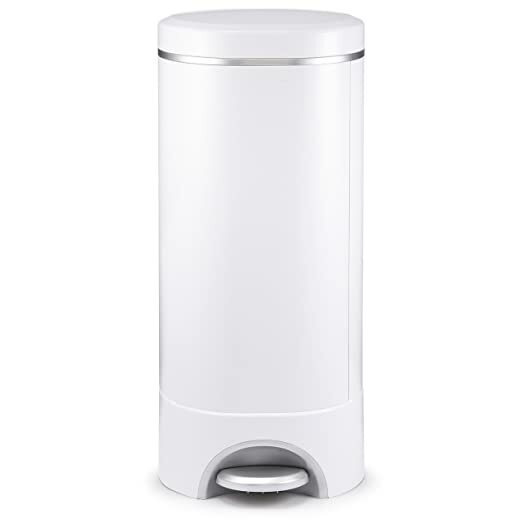 It is definitely our mommy pick for the best diaper pail in our list. It can also be converted to an ordinary trashcan. However, we do have an honorable mention for 'Value for money'. With satisfactory odor control and capacity, the Baby Trend is definitely the cheapest diaper pail to own and even purchase at a price that is less than half of most of our diaper pails.